Location: Located on an island at the cross-roads with Paradise Road, immediately N of the main street, Pant-yr-Afon. 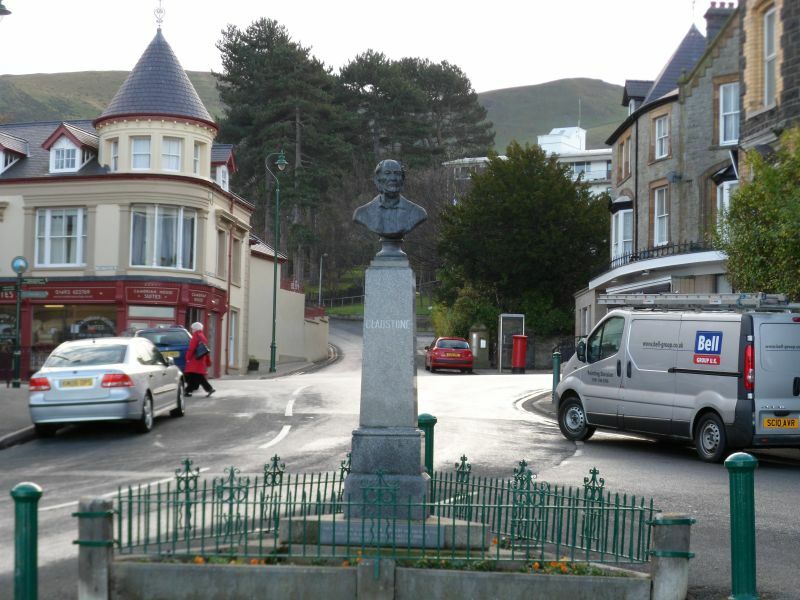 Erected by public subscription in 1899 in memory of W E Gladstone, Prime Minister, a frequent visitor to the town due to his friendship with the quarry-owning Derbyshire family. Life-sized bronze bust of Gladstone on a polished granite obelisk; the four faces are inscribed respectively: 'Gladstone', 'Statesman, Orator, Scholar', '29 Dec 1809 to 19th May 1898'. And 'Erected by Public Subscription, 1899'. The obelisk stands on a triangular (unpolished) granite base, itself within a triangular dwarf-walled flowerbed enclosure; decorative iron railings, modern protective bollards. Included for its historic interest as a late C19 municipal monument in a prominent location. Set back slightly from the road at the junction with Graigllwyd Road; behind low copied and railed walls enclosing a partly-bedded, inclined forecourt.